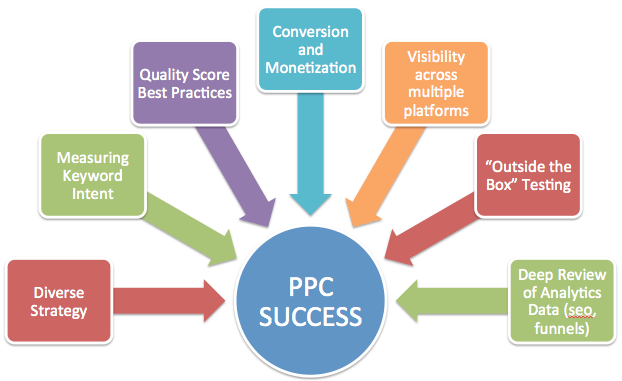 PPC is one of the best mediums to quickly build a brand image or reinforce one with the maximum control over integrity. The PPC management by Diligent Web Tech is completely in line with the ever evolving marketing goals and one that necessary ensures success. The team comprises of highly skilled professionals that thorough understand the nitty gritties of PPC management and accomplish the management tasks. Needless to say, with Diligent Web Tech one can be fully assured of traffic, rankings and higher returns on the investment. The relevant listings/ads linked properly with the destination are displayed upon the specific phrases in the search engines. According to a research, 72% of PPC marketers (those who use pay-per-click advertising) plan to increase their PPC budget in 2014. The nominal fee charged per click (aka ‘pay-per-click’ or PPC), is a straightforward and effective method of achieving placement through paid-search. The innovative group of professionals believe in getting the task done with a simple/sophisticated and planned approach for doing it. The most effective and accurate utilization of tools like Google Adwords, Google Sitemaps, Overture and MIVA provide an accurate assessment of the key phrase popularity. The performance is measurable and this is of the essence while launching an effortless and impactful PPC campaign. Simultaneously, optimal utilization of the target resources is made a mandate with gap analysis . This identifies the biggest potentials for improvement and further furnishes important insights. The existing recurrent and the grafted loopholes are weeded out in accordance with the key phrase behaviors. Thorough comprehension of the core requirements as well as objectives of your business, that's a necessity while crafting effective PPC strategies. PPC strategies that make an impact, as they target Google AdWords, Facebook and LinkedIn for maximum benefits. Carefully articulated and well-designed display Ads, for maximum clicks and lead generation. Engaging and intuitive landing page designs that deliver your message clearly along with an increased rate of conversion. Regular testing of PPC campaigns and landing pages, for ceaseless innovation that yields improved results from Digital Marketing.